U2 are reissuing four recordings this year on 180g vinyl. All four vinyl have been out of print. The four recordings include two albums, Pop and All That You Can’t Leave Behind, the compilation The Best of 1980 – 1990, and the EP Wide Awake in America. Pop, All That You Can’t Leave Behind, and The Best of 1980 – 1990 have all been out of print since the initial releases in 1997 – 2000, and command three digit prices at auction, as they weren’t pressed in large quantities when originally produced. These three will be issued with new catalog numbers. All That You Can’t Leave Behind will be released under the catalog number 5796988 (Original 2000 release was U212/524653-1), Pop will be released under the catalog number 5796999 (Original 1997 release was U210/524334-1) and Wide Awake in America will be reissued under the catalog number 5797084. The UPC for these new releases will be 602557969887 for All That You Can’t Leave Behind, 602557969993 for Pop and 60255797084 for Wide Awake in America. All That You Can’t Leave Behind, the tenth studio album from U2, garnered multiple Grammy awards following its release in October 2000 and shot to #1 in 32 countries. Produced by Daniel Lanois and Brian Eno, and recorded in Dublin (HQ, Windmill Lane, Westland and Totally Wired) and the South of France, it includes the singles Beautiful Day, Stuck In A Moment You Can’t Get Out Of, Elevation and Walk On. Remastered and pressed on 180gsm vinyl, this reissue also includes a download card. The artwork comprises a 16-page booklet featuring lyrics and photography by Anton Corbijn. 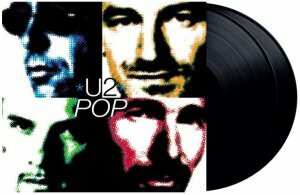 3rd March 2018 marks the 21st anniversary of Pop, U2’s ninth studio album, which reached #1 in the UK, US, Ireland and 26 other countries around the world following its release in 1997. Produced by Flood, with Howie B and Steve Osborne, the album was recorded in Dublin (Hanover Quay, Windmill Lane, The Works) and Miami (South Beach Studios). It features the singles: Discothèque, Staring At The Sun, Last Night On Earth, Please, If God Will Send His Angels and Mofo. Remastered and pressed on 180gsm vinyl, this reissue includes a download card. The artwork has been faithfully reproduced from the original release, including a gatefold sleeve, printed inner sleeves and a lyrics insert. 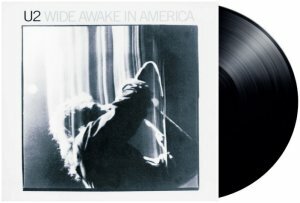 Wide Awake In America is a four-track half live/half studio EP from 1985. Originally released only in North America and Japan, it was subsequently re-released internationally in the late 1980s. Side A features live performances of A Sort Of Homecoming and Bad from UK shows on The Unforgettable Fire tour in late 1984. Side B features two B-sides from the 12” single of The Unforgettable Fire – The Three Sunrises and Love Comes Tumbling. Remastered and pressed on 180gsm vinyl, this reissue includes a download card and the artwork is a faithful reproduction of the original. Last March we were able to tell you about a plan to reissue U2’s albums on vinyl. At that time two releases were released on vinyl, How to Dismantle an Atomic Bomb and a new version of War. When we spoke with Universal they confirmed that this was part of a bigger planned reissue, and that if sales were good, additional albums would be issued. We were told at the time that All That You Can’t Leave Behind would possibly be released in the fall and that Pop would be close behind. Last summer a new version of The Joshua Tree was also issued on vinyl as well as other formats to celebrate the 30th anniversary of that album. This release of The Joshua Tree and later Songs of Experience caused the reissues of other albums to be put on hold according to sources at Universal, delaying the planned Fall 2017 release of All That You Can’t Leave Behind until now. All three releases in April are listed as being remastered in the Amazon listing. The Edge recently directed remastering of All That You Can’t Leave Behind, Pop, and Rattle and Hum for the 2017 MFIT Editions on iTunes. It is not known if this is the mastering that will be used or if there was additional work done for these vinyl pressings. Wide Awake in America was remastered for the 2009 release of The Unforgettable Fire and was included in the deluxe edition of that album, and this was the version used for the 2017 MFIT Edition. Pop will be a double vinyl set, as was the original 1997 release. 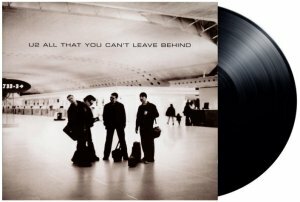 All That You Can’t Leave Behind and Wide Awake in America will both be single vinyl sets as were the original releases. Vinyl has grown to be a big industry in recent years, and is one format of music where there is growth in sales year after year. Universal has been pressing U2 vinyl over the last few years to meet the growing demand for this format. These new releases would join Boy, October, War, Under a Blood Red Sky, The Unforgettable Fire, The Joshua Tree, U218 Singles, Songs of Innocence and Songs of Experience as albums being kept in print by Universal Music at this time. This represents the entire U2 catalog with the exception of No Line on the Horizon, The Best of 1990 – 2000, Achtung Baby, Zooropa and Original Soundtracks 1. (Achtung Baby was available in 2011 as part of the re-issue campaign but has become difficult to find.) The Best of 1990 – 2000 is also not currently in print in a vinyl format. These new pressings were originally announced in early February 2018. (We first wrote about them on February 11, 2018) A listing of upcoming records at the Jungle Records record store in Denmark first listed the four reissues with a release date of April 6, 2018. Prices listed on the Jungle Records listing were 30.84 Euro / 37.80 USD (Pop and The Best Of), 24.14 Euro / 29.58 USD (All That You Can’t Leave Behind) and 16.09 Euro / 19.72 USD (Wide Awake in America). A second site in Denmark, the Record Pusher site listed that The Best of 1980 – 1990 release would not come out until July 27, 2018. Both listings were premature and both stores were asked by Universal to remove these listings. The Amazon listings today are listing a new release date of April 13, while Universal is still telling us that these will be released on April 6. Many of these albums have been out of print for a number of years, making them popular on the collector market. However this has also meant that bootleg copies of these albums have been pressed and sold in recent years. Both Pop and All That You Can’t Leave Behind have been pressed in low quality picture disc formats. These pressings are not legitimate pressings by Universal and have not been authorized by U2 or by Universal Records. While the picture disc pressings make these bootlegs easy to identify there are also reports of bootlegged versions of these albums on black vinyl, which are far more difficult to distinguish from the original. We urge caution if ordering these new pressings on vinyl, as some secondary sellers using Amazon do appear to have the bootleg versions listed for sale. If these four are coming, it is likely that Universal is using The Best of 1980 – 1990 and Wide Awake in America to test the market for further releases of the non-album back catalog. We are told that additional reissues could be scheduled for this Fall. Many thanks to Edgar / nahuise for the initial information on these releases.